This campaign ended on April 16, 2019, but you can still make a gift to Wellesley College by clicking here! Get 3 friends to give and we'll send you digital campus photos perfect for your smartphone wallpaper. Show your Wellesley pride! Get 10 friends to give and we'll send you a mini felt Wellesley pennant magnet. Inspire 25 friends to give and receive a blue Wellesley pashmina. The first person to reach the lofty goal of generating 50 gifts will receive a custom pair of Wellesley sneakers. Generate $50 in challenge gifts and receive a Wellesley "W" keyboard sticker. Generate $250 in challenge gifts and receive a limited edition die cut, stainless steel Wellesley lamppost bookmark. On April 15, the Wellesley community will come together to move Wellesley forward in a single day. A group of generous Wellesley supporters have collectively committed $300,000 in challenge funds to inspire 3,000 gifts to the College during this 24-hour challenge. 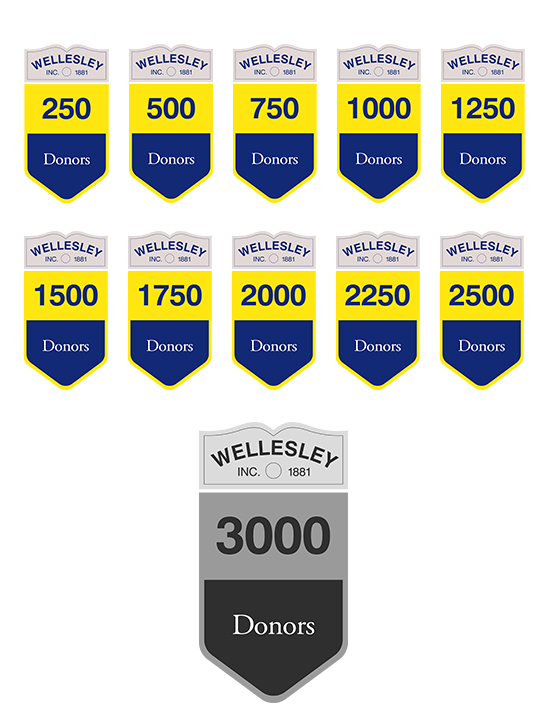 This means that your gift on April 15 will go even further to ensure Wellesley remains bold, creative, and innovative. All gifts to the challenge will support areas of The Wellesley Fund. These budget-relieving dollars will be put to use this fiscal year (July 1, 2018 - June 30, 2019) to address the College's most urgent needs. Giving through The Wellesley Fund supports financial aid, academic departments, faculty and student research, career education, campus renewal, athletics, and so much more. Will you be one of the 3,000 donors who helps us cross the finish line on April 15? Join for the cause, stay for the excitement, and watch as you and your Wellesley community move Wellesley forward in just 24 hours! 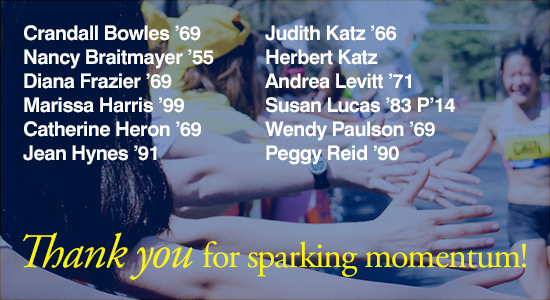 To make the Marathon Monday Challenge possible, the following Wellesley supporters offered their generous and increased commitments to the College. With their generosity, we have the power to inspire others and fuel transformational educational experiences at Wellesley.